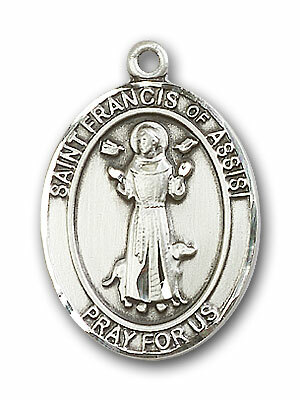 1 x 5/8-inch Sterling Silver St. Francis of Assisi Medal. 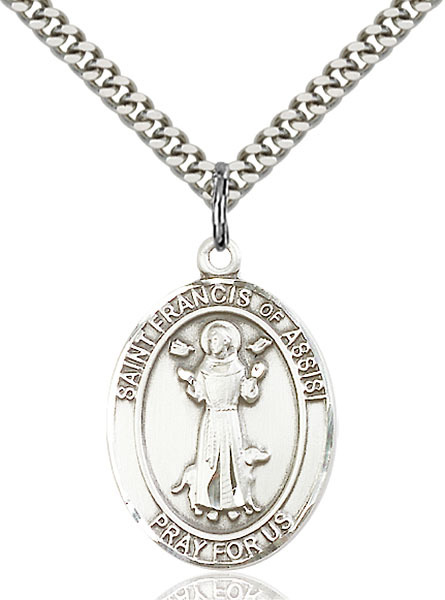 1 x 3/8-inch Sterling Silver St. Francis Medal. 1 x 3/4-inch Sterling Silver St. Therese of Lisieux Medal. 3/4 x 1/2-inch Sterling Silver St. Francis of Assisi Medal. 1/2 x 1/4-inch Gold-Filled (14K) St. Francis of Assisi Medal. 1 1/8" Sterling Silver Oval Miraculous Medal with 24" Chain. This 1 1/8" Sterling Silver Oval Miraculous Medal with 24" Chain is made in the USA. 7/8" Sterling Silver Portrayal of St. Emma wearing a Crown holding Bread. She is the Patron Saint of Good Works. This Sterling Silver Oval Shaped St. Emma Medal is made in the USA.